Midfielder Danny Schofield has completed his move from Huddersfield to Yeovil Town. The 28-year-old was out of contract with the Terriers and has signed a two-year deal at Huish Park after agreeing the move in May. Schofield told Yeovil's website: "After nine years at Huddersfield I felt the time was right for a change. "When I spoke to Russell Slade [Yeovil manager] he soon convinced me that Yeovil was the play to come." Schofield had been a long-term transfer target for Slade, who said: "This ends the search to replace Arron Davies as Danny is extremely versatile as he can play on the left and right wing and down the middle. "He can get a goal so we are delighted that he is coming down to Yeovil." 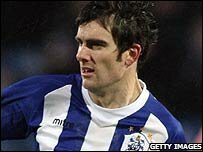 Schofield asked to leave the Terriers in February and played the last of his 289 games for Huddersfield against Luton on 3 May. He spent 10 seasons at the Galpharm Stadium after signing from non-league side Brodsworth Miners Welfare in August 1998, scoring 46 goals. Meanwhile, seven out-of-contract players have been released by Yeovil, including first-teamers Anthony Barry and Mark Lynch. Youngsters Jerahl Hughes, Ishmael Welsh, Stephen Maher, Darryl Knights and Wilfried Domoraud have also left.